The trend toward local foods is one of the movements that makes tremendous sense to me in the current emerging economic environment. Here in the Triangle region (Raleigh-Durham-Chapel Hill, North Carolina, USA), a local startup, The Produce Box, has been been making weekly deliveries of local foods for the past couple of years. Each week during the harvest season, we receive a box of produce picked the previous day ($22 for a smaller box, $38 for a larger box) delivered automatically and paid online by credit card. The foods we receive aren’t flawless, and there’s no promise that they are 100% legally organic. But they’re fresh and delicious and local. The Lee Farm, the main farm that supplies The Produce Box, doubled its acreage under cultivation from 50 to 100 acres in just the past year because of this venture. Because of the unique nature of this new food system, where they are growing FOR US, they don’t feel the pressure to produce a completely unblemished, beautiful product. They know that we would much rather see a small blemish we can cut away than have our food saturated with pesticides. So they use less pesticides and incorporate such farming practices as growing in black plastic for weed control and irrigation, using a closed water source (no open wells, ponds, etc.) to reduce contamination possibilities and applying insectisoaps rather than pesticides when they can. They are “thoughtful” about the way that they farm, and the way that they pack your fresh veggies. The produce that comes to you in the morning was picked the day before and packed that previous afternoon at the farm by the Lee’s and their helpers. How Can Local Economies Transition to a Petroleum-Scarce World? Today I read an interview in New Scientist with Rob Hopkins, a key figure in the Transition Towns movement — see “Rob Hopkins: Getting over oil, one town at a time.” He writes about how communities can transition to a more sustainable economy at Transition Culture. A Transition Town is formed when a group of individuals gets together to ask how their community can mitigate the effects of a potential reduction in oil and drastically reduce their carbon emissions to offset climate change. The scheme has become so successful we now have 250 official Transition Towns and Cities worldwide, with many more interested in becoming involved. In an infographic called “Six Ways to Die,” he sketches out a map of the infrastructures that keep us all alive and illustrates how lives are threatened when those infrastructures fail or are disrupted. The Hexayurt is a sheltering solution made from flat panels that can be quickly and cheaply constructed but are much more durable than emergency tents. Here is a very useful video, “Ending Poverty With Open Hardware,” in which Gupta explains some important concepts about how to prevent loss of life using open technology. Follow this link for a gallery of photos showing how the hospital was set up. The mobile field hospital is 9 tents, and each is about 100 square meters, so the total is about 900 square meters. The land we’re using is a former football field, so it’s the perfect space for this, nice and flat. 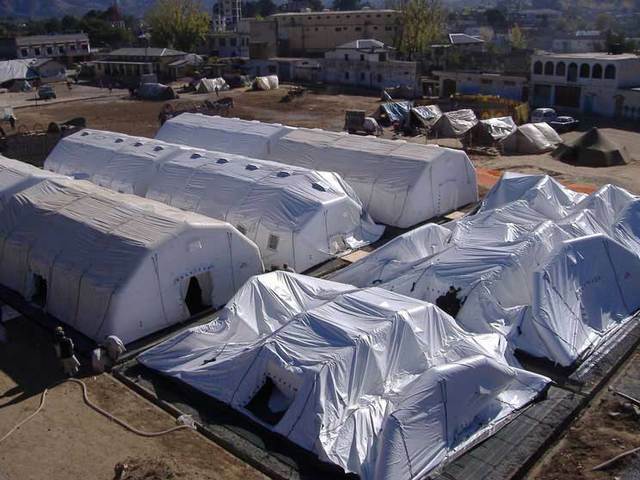 [The hospital consists of the] 9 tents, 100 beds, including hospitalization and ICU and recovery beds. A triage and emergency tent, and two operations theatres. The idea is that within the tent we have a complete kit we can deploy including energy supply, water supply, all the sanitation, and all medical equipment inside the tent. In Haiti, everything needed to run a hospital including beds and biomedical equipment is included. We want to be as autonomous as possible with regard to energy. In this case we have one 30 KV generator and one 60 KV generator. Plus an electrical board, and equipment to ensure electrical safety. And then you have all the electrical wire you need to set up lights inside the ward, and set up plugs for the medical equipment. We are working with standard MSF equipment, we have R&D centers and storage in Europe, in Bordeaux and Brussels. When the equipment reaches the field, typically you have to face some technical issues, some small problems, but the big issues have been solved. One of the problems we had the first time we used this hospital in Pakistan in 2005 was that there was a big difference in temperature between day and night, at night the tents were deflating. The pressure inside the tent was not enough and was creating a problem. Now we have gauges that constantly measure the pressure and trigger compressors to re-inflate if it goes too low. MSF’s solution speaks to the need for technologies that can be rapidly deployed in crisis situations to deal with medical needs. Previously I wrote out some thoughts about the need for solutions for post-bubble housing needs — see “Where will people live after the Big Bubble pops?” from June 2009 and “Haiti Disaster: Housing for When the Bubble Pops” from earlier this week, 20 January 2010. What I’m trying to get at is that, if the Bubbleconomics premise is correct, then the world is going to see increasing needs for large-scale relief solutions, as the global situation worsens and economic bubbles pop at all levels. This emerging regime will call for innovative efforts on the parts of governments, NGOs, and businesses to create solutions that can be deployed rapidly at large scale to meet such needs as housing, medical care, and food. Seeing the devastating effects on the lives of the people in Port au Prince, Haiti, in the wake of the recent earthquake emphasizes the potential value of emergency housing solutions for recovery. In such a disaster, survivors are thrust into chaos and forced to live in unstable, unsanitary conditions, seeking out housing any way they can. It seems to me this suggests a need and opportunity for emergency housing solutions that can be quickly and massively deployed by governments or NGOs. Just having the housing technology, though, isn’t enough, as demonstrated by the difficulties of getting medical and food assistance to the people in Port au Prince. The problem isn’t necessarily getting relief resources in the first place, but in getting them implemented and distributed. Deploying emergency housing for potentially hundreds of thousands of people would require a tremendous amount of advance expenditure and organizational infrastructure. So the solution that’s called for is more along the lines of an urban-planning project rather than just an architectural problem. Suppose it were possible to manufacture in advance the components of a massive portable community that could be stored in advance and deployed rapidly anywhere in the world? Where will people live after the Big Bubble pops? If the Big Bubble proposition turns out to be true, the world could be faced with hundreds of millions or even billions of people homeless or under-housed. Where might people live if they lose their incomes and can’t pay rents and mortgages? Some might have the ability to live off the land, join with relatives, or form intentional communities. But it’s easy to imagine large displaced populations lacking housing. When it comes to housing, I think it’s useful to look at alternatives that are emerging in various corners of the earth where people are already suffering from scarce resources. Interesting solutions often arise from such conditions. Recently I learned about a housing solution being developed by Tata Group, a $62.5 billion Indian company that operates in multiple businesses, including IT, communications, energy, chemicals, and other industries. Tata is the company that has developed the Nano, an auto that sells for as low as US $2,800. In that same spirit, Tata Housing is building a “nano-housing” complex consisting of very small units designed for affordability. The project, called Shubh Griha, is in Boisar, a suburb accessible to Mumbai. The living units advertised by Tata are 283 square feet, 360 square feet, and 465 square feet. From Tata’s price list, it looks as if the smallest unit would sell for about 400,000 rupees, or about US $8,500. Tata describes Shubh Griha as “an integrated township with all the basic amenities” and “a clean and green environment.” The development is planned with a footprint allowing 70 percent devoted to common area. In the U.S., “tent cities” have received some press over the past year as increasing numbers of people become homeless. In some areas, such communities have received assistance from governmental and non-profit organizations — for example, see information here about tent cities in the Seattle, Wash., area. Dignity Village in Portland, Ore., is an example of a former tent city that has evolved into an established intentional community with its own administrative and security infrastructure. No violence to yourself or others. No alcohol, illegal drugs or drug paraphernalia on the property or within a one block area. You must contribute to the maintenance and operation of the Village. thousands who live in Mong Kok district and who rent “cage apartments,” stacked three high and measuring six feet [1.8 m] long by 30 inches [0.8 m] deep and 30 inches [0.8 m] high. They have space for a mattress and a few personal belongings. No furniture. All of this is written not to scare the pants off of people, but to point to the issues that arise for individuals when their personal bubbles deflate, and what could happen to masses of people worldwide if the Big Bubble collapses. The need for housing alternatives points to an area where innovation could benefit millions and where an opportunity exists for governmental agencies, non-governmental organizations, and entrepreneurs. On April 9, 2009, Forum for the Future announced that it has awarded a $75,000 prize to Kyoto Energy for its Kyoto Box, a cardboard solar cooker designed for households in developing lands. The foil-lined cooker can be made for only 5 Euros and can boil water as a substitute for woodburning. Wood fires are considered a major source of deforestation and pollution in developing lands, as well as a source of greenhouse gases. They also present a household fire hazard and a danger to families’ health due to smoke inhalation. The Kyoto Box (photo below, courtesy of Einar Lyngar, shows Kyoto Energy founder Jon Bohmer with the box) received the $75,000 prize in Forum for the Future’s FT Climate Change Challenge, which aims to “raise the profile of green innovation and demonstrate that there are solutions and money can be made from them,” according to the organization. The prize is sponsored by HP and FT (Financial Times). From the Bubbleconomics perspective, innovations like this represent, on the one hand, examples of entrepreneurial opportunities offered in the context of the Big Bubble problem — the proposition that the world economy is in an unsustainably overinflated state. For more details about the Kyoto Box, see this illustration at Kyoto Energy’s web site. Kyoto Energy offers some other interesting products, such as the Kyoto Turbo, a smokeless biomass cooker; the Kyoto Bag, a water carrier that can double as a solar-powered shower; and Kyoto Flash, a solar-charged light with battery backup. The company is also doing considerable work with larger-scale solar energy. The company is based in Nairobi, Kenya.